For much of the world, food is fuel. But far more than mere sustenance, food draws us together. It slows our pace and brightens each day. Calling upon all five senses, cusine reaches deep into our psyche and becomes woven into our memory. Futhermore, the art of preparing food is often an act of service, a vocation of creativity, or a labor of love. Each distinct culture draws upon its geographical pantry to afford the practical and please the pallate. 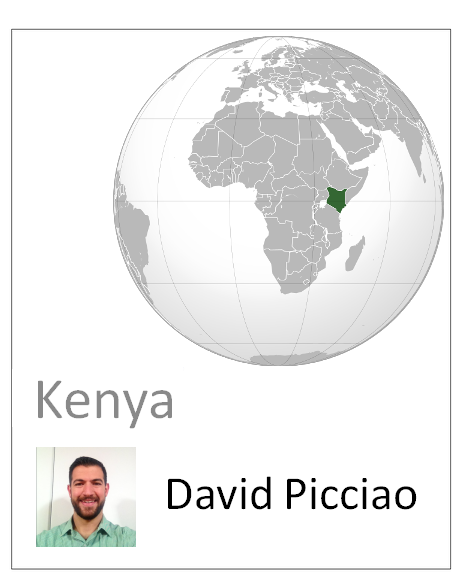 Thus, it would be impossible for our global team of Kiva Fellows NOT to mention our experience with cuisine as we serve in the field. Ten valiant Kiva fellows have taken to the streets in the pursuit of the perfect dish. 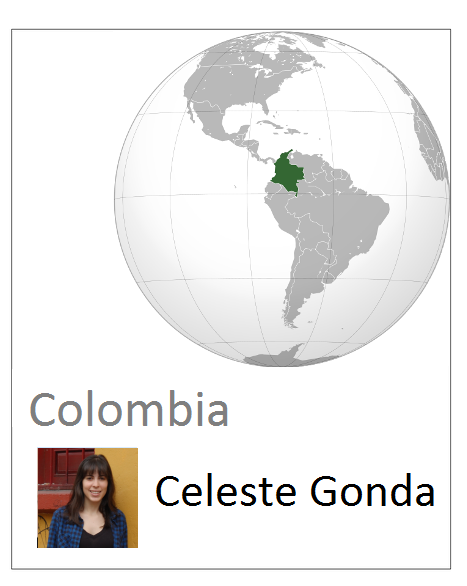 Throwing caution to wind, we braved the sanitary violations to bring you our this month’s collaborative blog post. Join us on a quick gastronomic tour as we bring to the table, a Potluck of sorts (pun intended), KF22’s favorite Street Food from around the world. 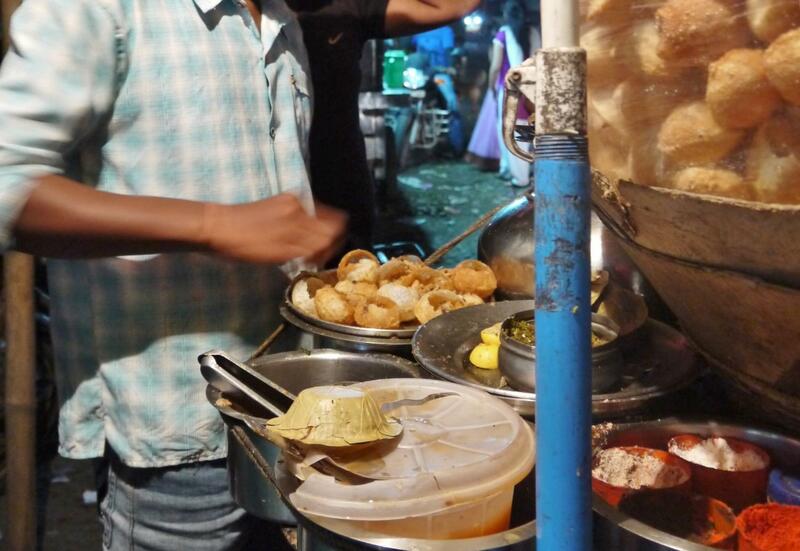 Futchka is a street food found throughout much of India. 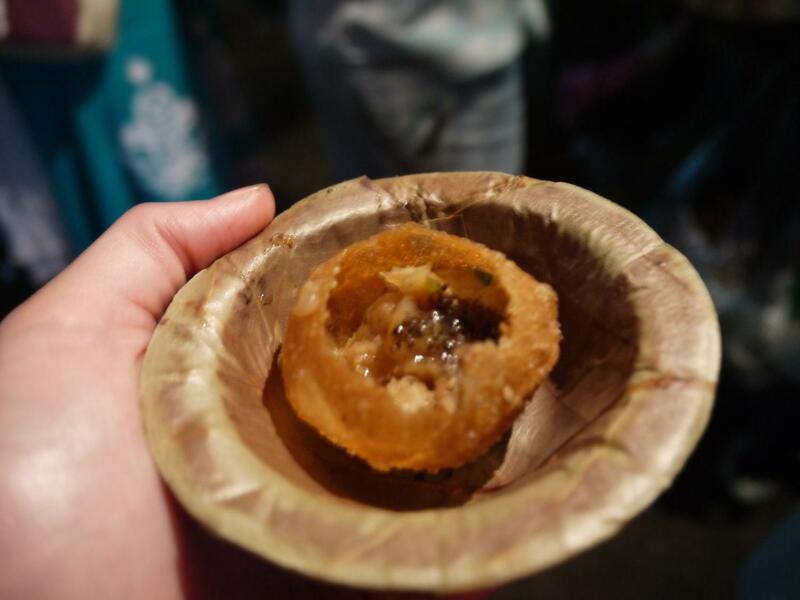 In Delhi it’s called panipuri and in Mumbai it’s golgappa, but the Bengalis refer to it as futchka. 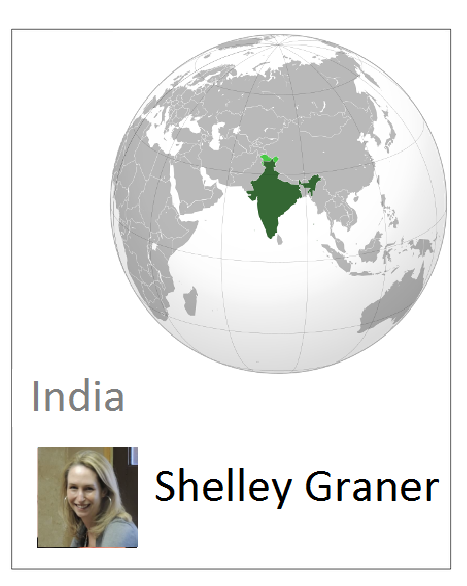 10 rupees (about $.15) will get you five small pieces served one at a time in an environmentally-friendly leaf bowl. The base of futchka is made of wheat flour and deep fried until it puffs up. Then, the wallah, or stand-worker, punches a hole in the top and puts a mashed concoction of potatoes and spices inside. It is finally topped off with several different options including chopped, boiled chilies, black salt, cumin, chili flakes and more. 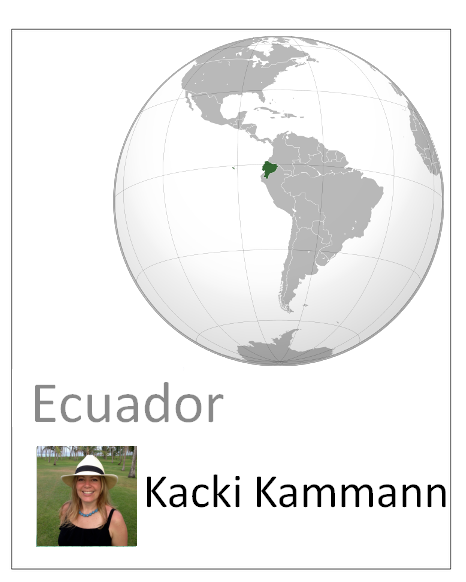 As a foreigner, this is where your futchka experience ends. For locals, the whole thing is then dunked in a bucket of “shower water”, tamarind juice, and other spices before it’s served. Shower water refers to water that has been unfiltered and not used for drinking, a leap of intestinal faith even for locals. The whole thing is to be eaten in one bite; a delicious mouthful of crispy, salty, spicy, creamy goodness- even without the water bath. It’s the perfect 5pm snack. Because they’re served one at a time and can include different combinations of toppings, futchka wallahs need to be on their game, remembering who ordered what and how many each person has left as there are usually several people around the stand at once. It’s a snack and entertainment all in one! Food in Kenya is a beautiful reflection of its diverse population. 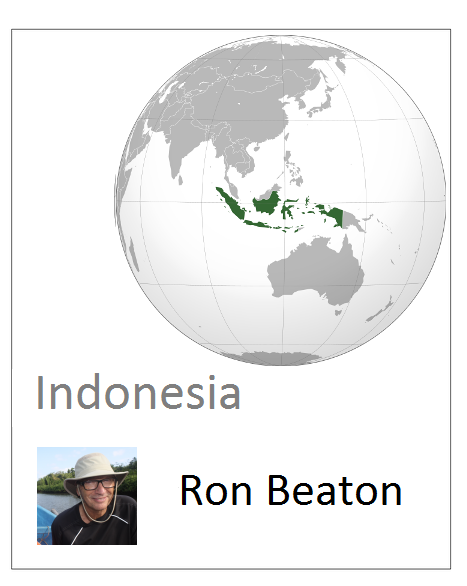 It has been a joy to engage with the people and learn about their cuisine. For instance, maize is a staple here in Kenya. 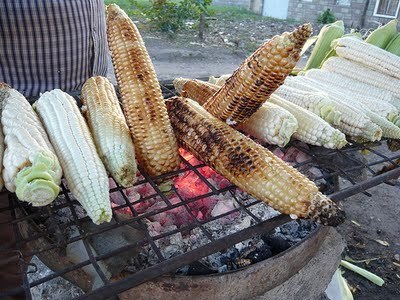 It is enjoyed in many different forms and recipes including ‘ugali’ and ‘githeri.’ Grilled maize is ubiquitous in Kenyan cuisine and can be found everywhere throughout Nairobi's streets. As seen in the picture below, you will find people keeping their coals hot in order to bring the maize to a dark, golden-brown crunchiness. It is a filling and portable snack available for just 40 Kenyan shillings. But no grilled maize snack is complete without a glass of fresh-squeezed sugar cane, with ginger and lime juice. Fresh-squeezed sugar cane is the essence of coastal Kenya in a glass and is a perfectly refreshing drink for the humid climate of Mombasa. Also priced at 40 Kenyan shillings, it’s worth every penny, or shilling for that matter. Watching the process was enthralling. 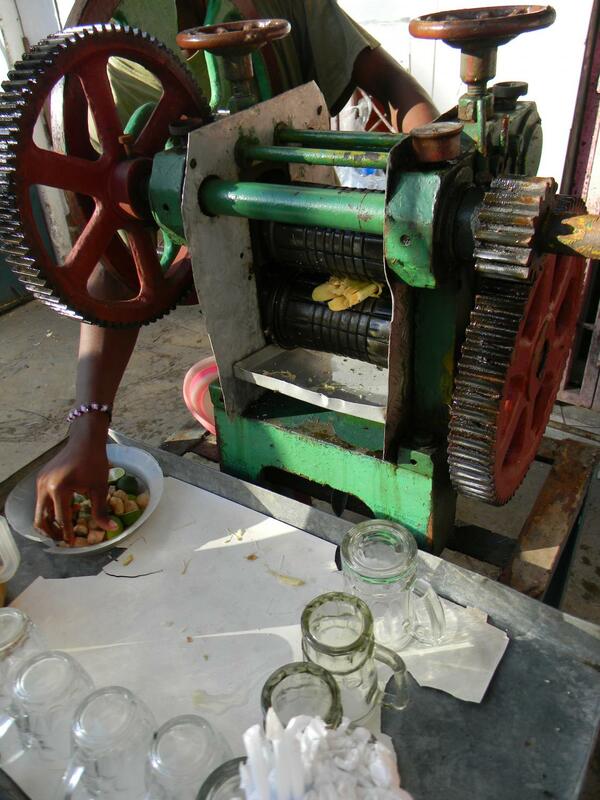 A few pieces of ginger and lime are sandwiched between two short pieces of sugar cane and then forced through the hand-cranked press. It is said that each ingredient represents a portion of Kenya’s multicultural population. The sugar cane is grown all over Kenya much like the African population, the ginger is a deep spice representing the descendants of Indians (from southeast Asia), and the green color of the lime could symbolize fresh influence of the muslim religion introduced by Arab populations. As a whole the deep, colored juice is an image of the beautiful caramel and dark-olive skin blend of Kenya’s diverse coast. On almost every block in Colombia, you will find vendors selling different types of fritos, which usually consist of a pastry dough filled with something delicious and then deep fried. 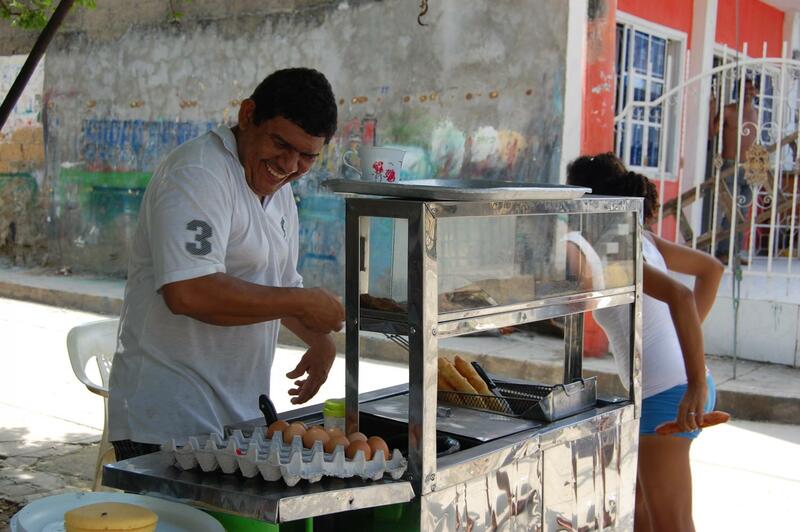 Here, Jorge Luis, a Kiva borrower from Cartagena, is selling arepas de huevo. An “arepa de huevo” is a typical frito from the Atlantic coast of Colombia, made of a corn cake stuffed with an egg, deep fried, and served with “aji,” a spicy sauce. They are traditionally eaten for breakfast, but are also a great mid-afternoon or midnight snack. Translated as "grilled chicken," Ayam Bakar is one of the most common foods on the streets of Cilacap, Indonesia where I spent six weeks. I also found this finger-licking goodness on the streets of Jakarta while I was there. It seems like Ayam Bakar is a near national dish and is traditionally cooked by fanning coals of wood chips. The bright flames and rich smell bring flocks of locals. Here, the owner of a local stand allowed me to try my hand at keeping those coals hot. 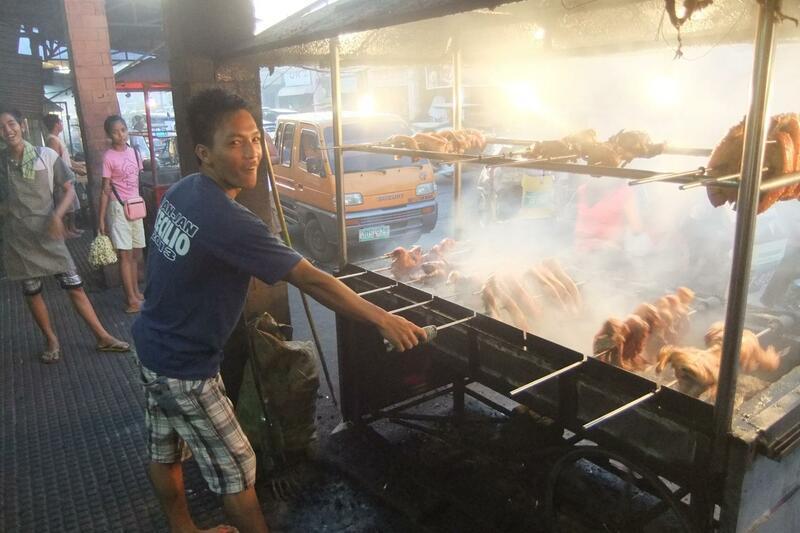 Also from the same region, one can find a fantastic dish of BBQ chicken and pork on the streets of Cabanatuan, Philippines. Local and tourists alike have found the Filipino grill to be a haven of flavor especially on Burgos street, which has been lovingly dubbed 'chicken street'. 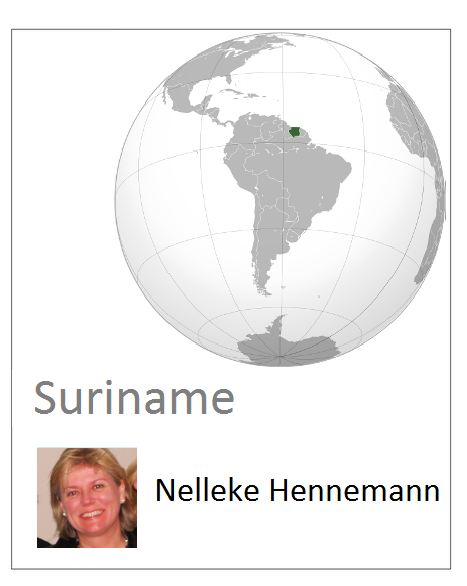 Please meet Mr. Bharat, the Ice Man of Nieuwe Nickerie, Suriname. He sells "schaafijs" (shaved ice), a combination of crunched ice in a cup, several brightly coloured syrups, and condensed milk. Schaafijs taste crunchy, refreshing and very sweet. One must trust the seller, since the ice is made from tap water, but the flavors are well worth the risk. Mr. Bharat takes special pride in his clean operations and his home-made syrups, slowly cooked from almonds and several fruits. 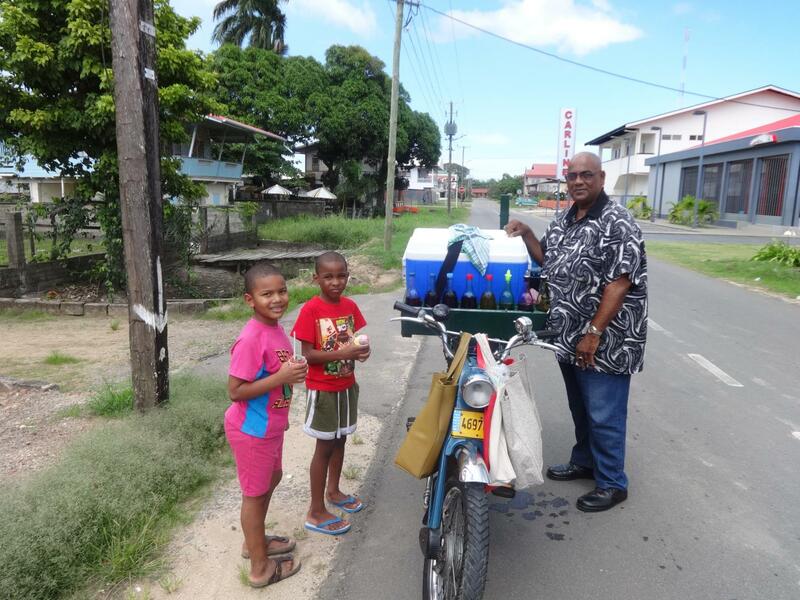 For the past 36 years Mr. Bharat follows the same route every day, passing by Nickerie's schools and hospital. He has plans to continue for another ten years, pr at least until his granddaughter has grown up. 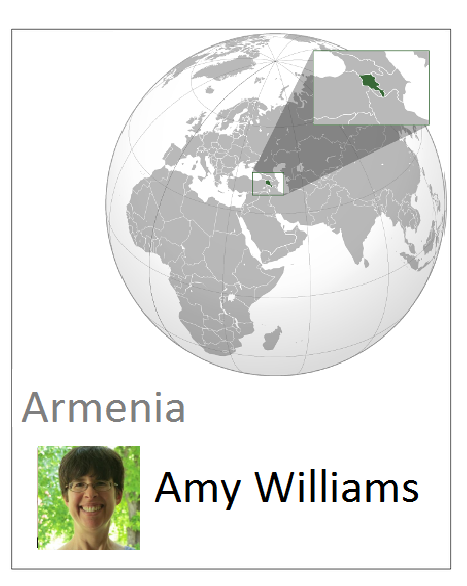 Outside of Amenia’s capitol city, Yerevan, I found some local delicacies in the village of Gerhard. In the picture below, there are a variety of dried fruits displayed on strings: apricots, peaches, figs, and cherries. 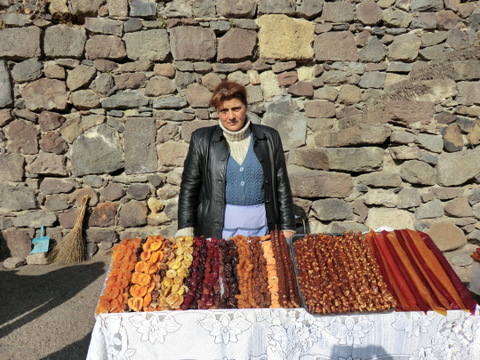 The dried fruit is called չիր (pronounced "cheer"). Next to this are strings of walnuts soaked in a cinnamon-sweet, fruit concoction and left to sun-dry. The platter on the right has the same walnut candy and some authentic fruit leather. The "cheer" and walnut candy are mainly saved for the 2-week long New Year's celebration, but I was lucky to find some on my visit! If you are hungry and looking for some great street food in Ecuador (and are not a vegetarian), ‘fritada’ is your best bet. You can find a good ‘fritada’ just about anywhere: in parks, roadside stands, nice restaurants, late night food carts outside bars, etc. It can come in various forms, but the essence of a ‘fritada’ is found in the fried chunks of pork meat, boiled hominy (large corn kernels), and a fried plantain companion. Roadside restaurant that only serves 'fritada'. 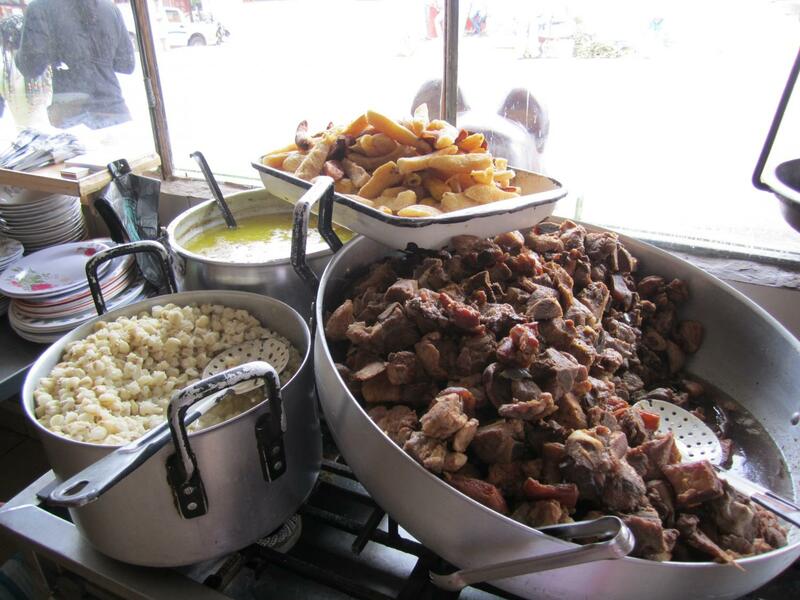 Here are some large batches of fried pork, boiled hominy, and fried plantains... yum! 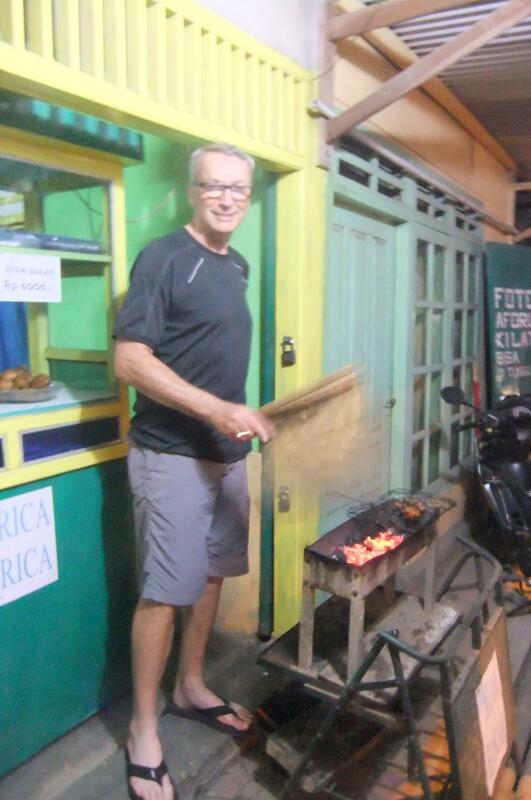 During a single week of traveling Ecuador to conduct borrower verifications, I ate ‘fritada ‘ three times! Despite almost going over-board on the fried foods, I am almost always up for a good fritada. 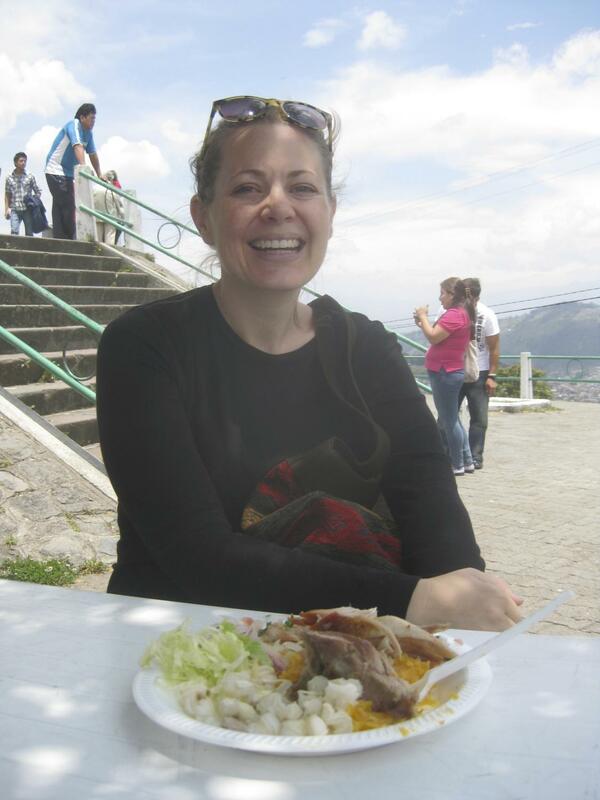 Kacki enjoying a version of 'fritada' on top of Panecillo in Quito. The Vietnamese dish, “Bún măng vịt" is a very popular food that can be found in any of the provinces of North Vietnam. 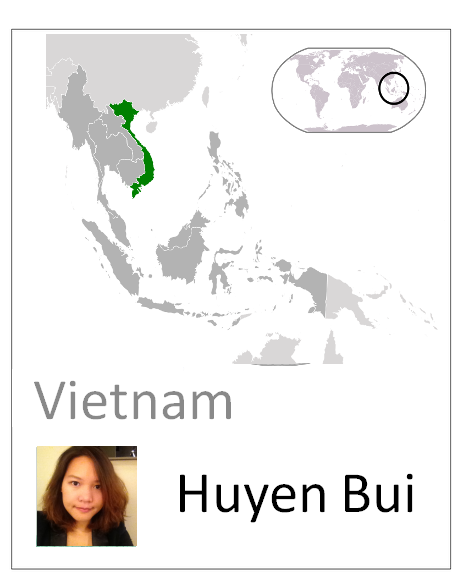 Served as breakfast or light meal, “Bún măng vịt” is translated as Vermicelli with bamboo shoots and duck. The ingredients are delightfully obvious. 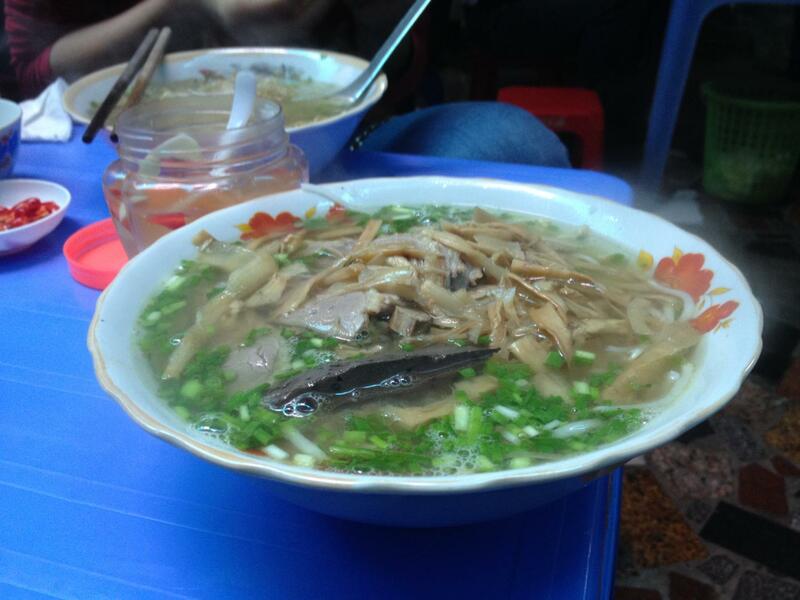 One can recognize a good “Bun Mang Vit,” when you can taste the subtle fragrance of bamboo shoots from the soup base. Depending on the season, the bamboo shoots can be found fresh or dried. But most importantly, the duck meat should be tender and juicy with a bright ginger dipping sauce to elevate the complexity of your bowl. Lake Victoria is Africa’s largest lake and the world’s 2nd largest freshwater lake by surface area after Lake Superior. The lake is shared by Tanzania, Kenya, and Uganda with 49% of it being in Tanzania. It is inhabited by some of the world’s largest Tilapia which are called Nile Perch in this area. A fresh fish is boiled or fried, served whole or in parts, and in stews or on sticks. It is so popular in Tanzania that I saw people check buckets of the fresh fish on my flight from Mwenza to Dar es Salaam to take back to friends and family. 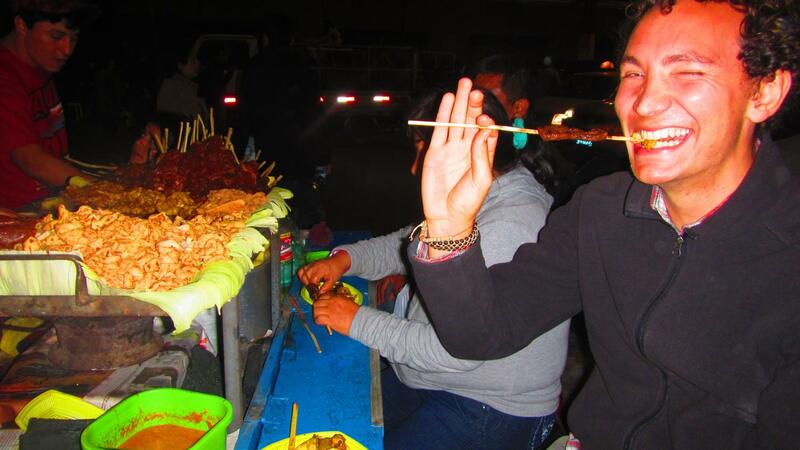 Found throughout Peru's Andean provinces, Anticuchos are a late-night delicacy in the Latin American street food scene. Roughly translated as "cut skewered meat" in Quechua, Anticuchos are a richly marinaded kabob of tender red meat and local potatoes. Seasoned with cumin, garlic, and aji, the most common cut features the meat from a bull's heart or stomach. 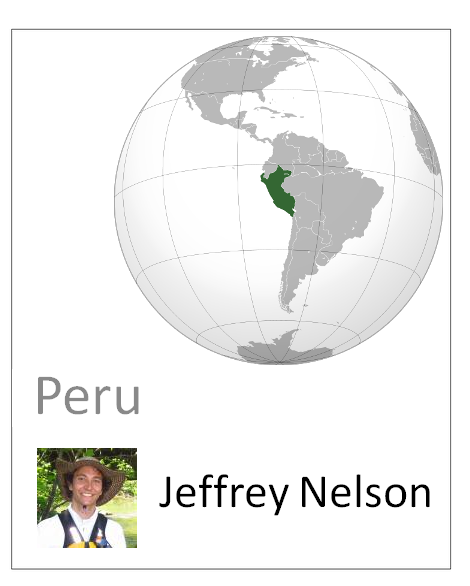 Here, I am taking a stab at the "Senor de los Milagros" festival in Lima, Peru.